Alex Zanardi was one of the fastest men on four wheels — winning two CART championships — that is, until a devastating accident in 2001 cost him his legs. But losing his legs hasn't meant he's lost his competitive drive. 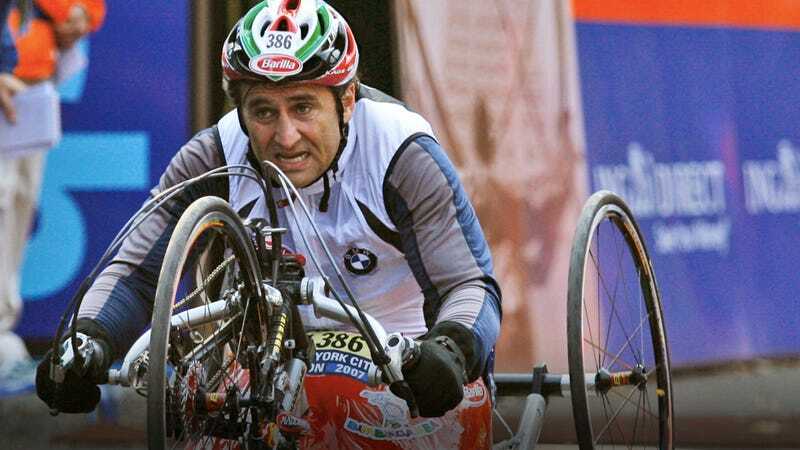 A decade later and Zanardi's now one of the fastest men on three wheels, winning the handcycle class of this weekend's New York City Marathon. Now that's a winner. The two-time CART champion's inspiration for competing in the New York City Marathon goes back to 2007 when a manager at Barilla told Zanardi he'd be crazy to try do it. Obviously Zanardi, who's the kind of guy that despite losing his legs still races in a car — only now with hand controls, simply had to enter. You just don't tell this man no because he'll just make you look foolish for doubting his resolve for a second. And that's what he did in 2007, when, in his first outing at the New York City Marathon, he came in 4th place despite only four weeks of training. Zanardi's just that tough. This year he finished the marathon in a time of 1:13.58, putting him just two seconds ahead of Polish racer Rafal Wilk. That's an average speed of about 21.25 mph. This victory gets him closer to his goal of competing in the 2012 Paralympic Games in London. Disability? Hah, Zanardi would disagree. His time was just under one hour faster than his opponents with two legs — even after this year's record-breaking 2:05:05 run set by Kenyan runner Geoffrey Mutai. Alex zanardi is the stud of all studs !!!! All I can say is wow !!! Yup, we couldn't agree more.